If you’re into adolescent androids, prepare for the best week of your life. TUESDAY: Roberto Roboto Volume One drops! WEDNESDAY: I’ve got a “Short Circuits” strip in Mega Man #43! Snag one at your local book store! 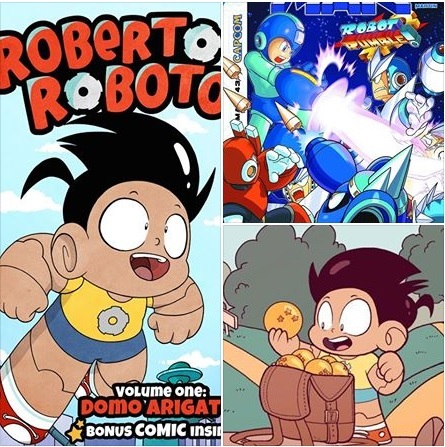 UNTIL DECEMBER 6TH: That Roberto Roboto X Dragon Ball crossover poster comic is hanging at Q Pop in LA until 12/6! If you’re not in town, you can buy a limited edition, numbered, autographed giclée by emailing “info@qpopshop.com”. This entry was posted in Uncategorized by ericmesquivel. Bookmark the permalink.